The three part routine is my favorite part of the phonics block. I love how flexible it is. It can take five minutes...or if we are coming back from a long weekend, and my students need some solid review, we can practice longer. I can even do parts of the routine in line. I have complete control of the phonemes/graphemes that my students are practicing. That darn 'qu' is just not automatic yet for some of my first grade readers, and so it remains in our three part routine, including our blending binder. 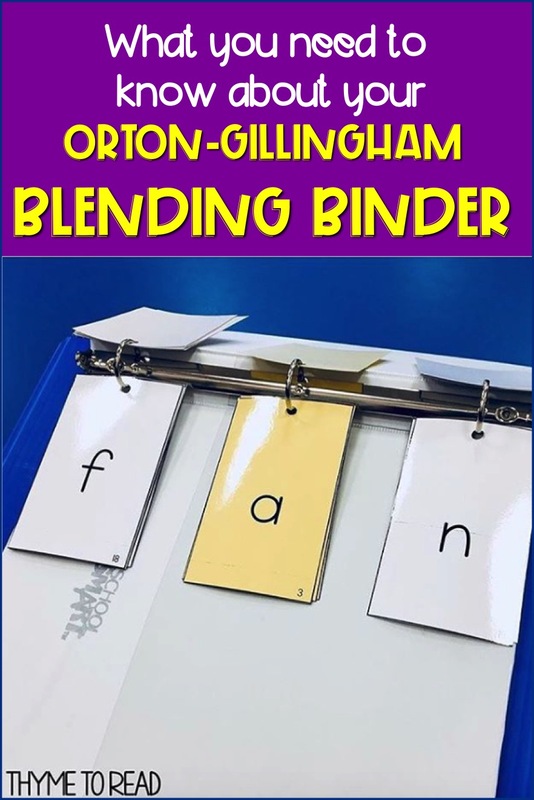 What is a Blending Binder? Very simply, it is a three ring binder filled with index card sized consonant and vowel graphemes. 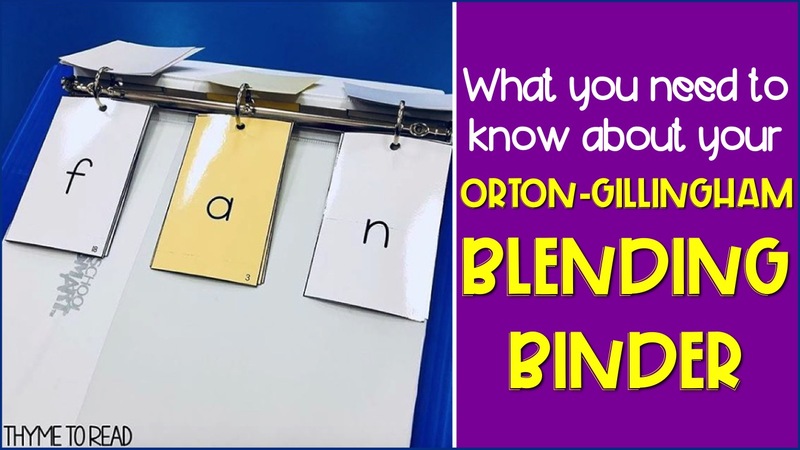 The binder helps to keep the cards organized and easy to use for the last drill of the three part phonics routine. I think the easiest way to set up our binder is to start with two sets of phoneme/grapheme cards. The first pack is a set of flash cards to use with steps 1 (visual) and 2 (auditory/tactile) of the phonics routine. This set can be shuffled as needed, and cards can easily be taken out of the deck once they are mastered. You can read more about parts 1 and 2 HERE. The second pack of cards, is to arrange in the three ring binder for blending practice. Having a second set exclusively for the binder will keep the cards organized based on initial, medial and final sounds, and ensure we are set to blend without needing to reorganize cards. What cards go in the initial, medial and final sound spots? I get this questions a lot from teachers who have already started setting up their binder. The cards that are the "hardest" to place are the A-Z consonant cards. Most of the other cards have a distinct place in the binder. Any letter that will create a vowel sound (like y, r, w) MUST go in the initial position. We also want to be conscious that some consonants can change the sound of our vowels (m and n). It does not mean these consonants have to go in the initial position, but only move them to a final position (or include a second copy) when your students are ready. Also having initial sounds that can be elongated into the vowel can help when it comes to blending "S-A-T >> SSSAAA-T >> SAT"
So here is MY list. This does not have to be your list, it is good to experiment. This is where all of the vowel sounds go. I have chosen to print my vowels on yellow, but some people choose pink or blue. 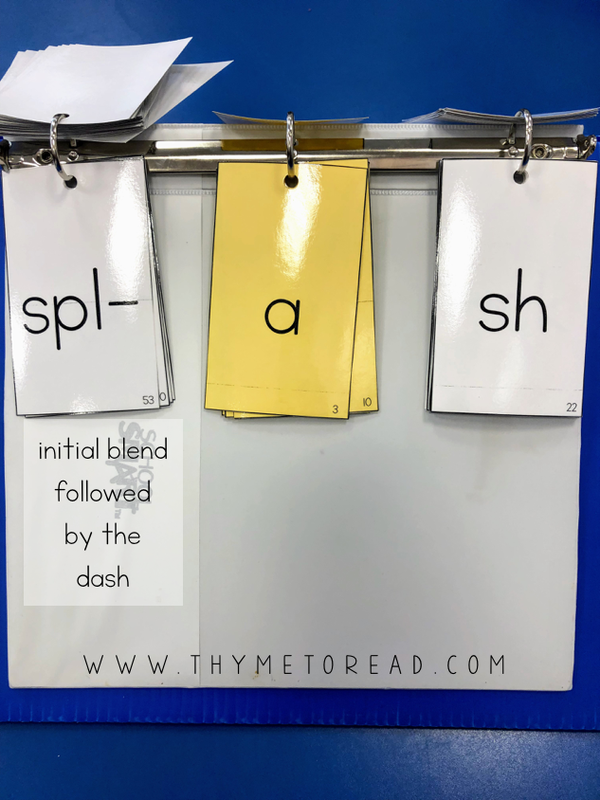 Really, you can pick any color you like, but having your vowel sounds on a special color help our students start to identify those sounds as a unit, and begin noticing patterns within words. Some vowel sounds do not go IN the binder. They are meant solely for parts 1 and 2 of the drill. An example of this are the silent e cards. a-e should not go in the binder because it will not help our students to read silent e words (however it does have a great place in parts 1 and 2, because our students should choral response with "a silent e, says a"). Much like the initial sounds, there is not a hard rule about what consonants go in the final location. I try to save some of the consonants that are used frequently in word families. Here is MY final sounds list. How do I Use My New Blending Binder? In the binder, real and nonsense words can be created. Eventually, I start to have my students look at these nonsense words as potential syllables in bigger words - with this, they are able to read open, closed, silent e, vowel team, diphthong, r-controlled and c+le words/syllables. Then we follow the "I do, We do, You do" gradual release model of practice. I model how I tap each grapheme, while verbally producing the sound. Then, using the same word, we do it together, and finally the students on their own. Then I change ONE grapheme. At this time, I check to make sure the word follows correct phonics rules - for example I would not want to have the word KAT, because initial /k/ when with vowel a should be a C). Do I Need More Than One Binder? Having more than one binder is definitely helpful. I have a binder for each of my primary groups. This is so I can add appropriate graphemes as my students are introduced to them. Because my groups are all at different levels, each binder has different cards. Full disclosure: Because I will never lie to you! 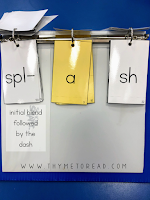 The phoneme/grapheme cards I have available in my TpT shop, do not create a low prep binder. Even with the various print options (direct to index cards or cut apart), it takes some time to prep. When I first started using a blending binder, I only had one. Then each year, I created another one, and each year, executing my phonics instruction has gotten easier. Every minute of prep work has been worth it (which is why I have created five for myself, and even more for colleagues) because the impact it has had on our students is monumental. What Are Other Teachers Saying? 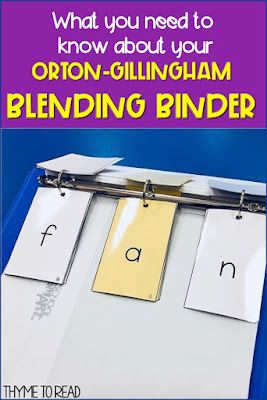 You do not need to take my word for it, other teachers are raving about the blending binders they have created to support their phonics block instruction. 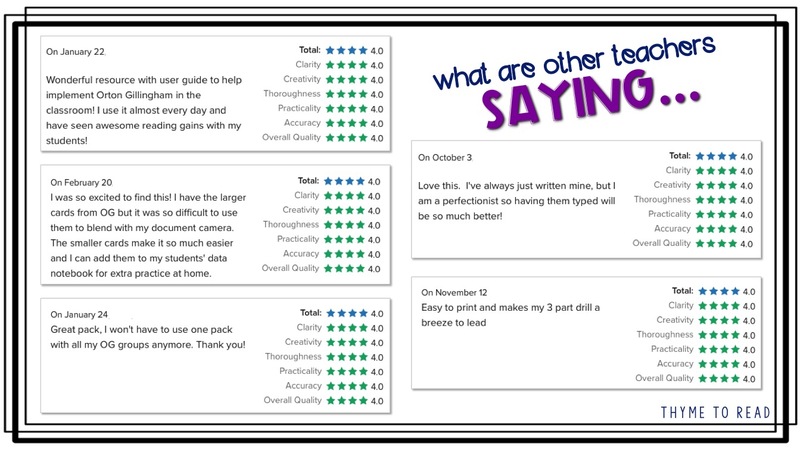 Overall, teachers feel that creating this binder has had a positive impact on instruction, improved student learning, and ultimately has saved time. Since using this tool with my students, they have become more successful and automatic with identifying vowel patterns in words. I hope sharing this tool will boost your students skills as well, and help to save you some time when planning your phonics instruction.